beat cream cheese, sugar, green tea powder till well cooperated then set aside. now, whisk heavy cream till foamy &amp; stiff then fold it into cream cheese mixture and blend till well mixed. crushed biscuit into fine crumbs one at a time, place one biscuit to each cups then spread on a layer of green tea mixture. top with some red beans and 1 tspn cracker crumbs, again cover it with a spread of green tea mixture. And keep refrigerated for 3 minutes to set. 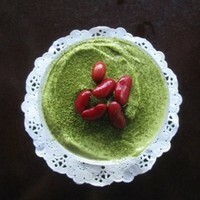 finally, decorate the top with with green tea powder and red beans when serving. Looks very different and yumm!